Europe is recovering from some hard times. You and a spouse must grow your 2-room hut and empty farmyard into a productive farm. You must sow and reap, raise animals and expand your family in order to thrive. Europe in the 17th century: a tough time to be a farmer! Agricola is a family-friendly strategy game. 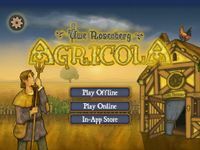 Simple to understand and great fun, Agricola lets everyone play to the end in a race to see who can build the most productive farm.